At the end of 2013 Gangjeong Grand March for Life and Peace (July 29 to Aug. 4), there is a huge and memorable human chain event for two hours in Gangeong village from noon to 2 pm on Aug. 4! The human chain is a succession of people’s daily human chain in front of the Jeju naval base construction(destruction) gate after daily Catholic mass and Gangjeong dance in protest to stop the Jeju naval base construction. Two more prisoners of Dr. Song Kang-Ho and Br. Park Do-Hyun! All four prisoners including Yang Yoon-Mo (the court added him fines of 2 million KRW on June 25, which means he would spend 39 days more of prison labor. Because of that, he would be released in May, 2014, not April, 2014) and Kim Young-Jae (the court dismissed people’s appeal for bailing on him on July 8) ! 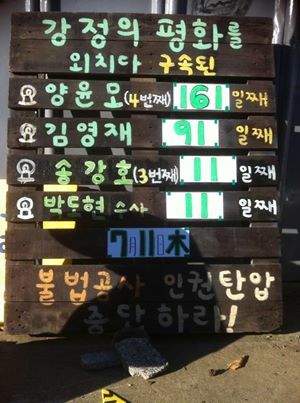 The daily struggle to stop the Jeju naval base project is being continued in Gangjeong. Peace-loving internationals, even though you may not be able to physically join, please join our human chain in spirit! HOW? _You may send us solidarity messages(up to 100 words)/ photos/ videos no later than July 20. Please see last year’s here. All the names will be put at the ending credit of Director Cho Sung-Bong’s documentary, “Gureombi Wind blows.” Dir. Cho plans to take air shot of huge human chain event on the day. 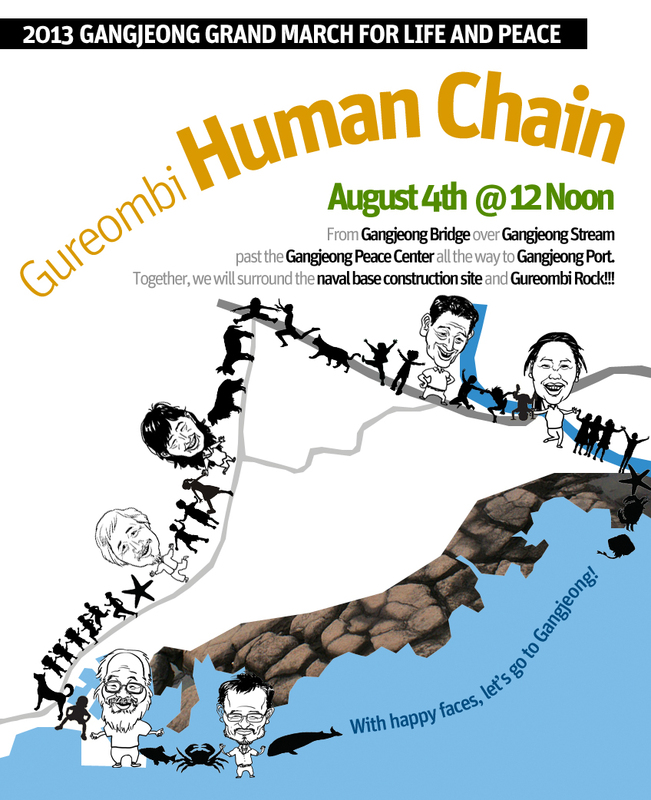 People in happy faces are to go ALL to Gangjeong to Join the HUMAN CHAIN to HUG GUREOMBI ROCK! Photo fwd by Choi Hye-Young. 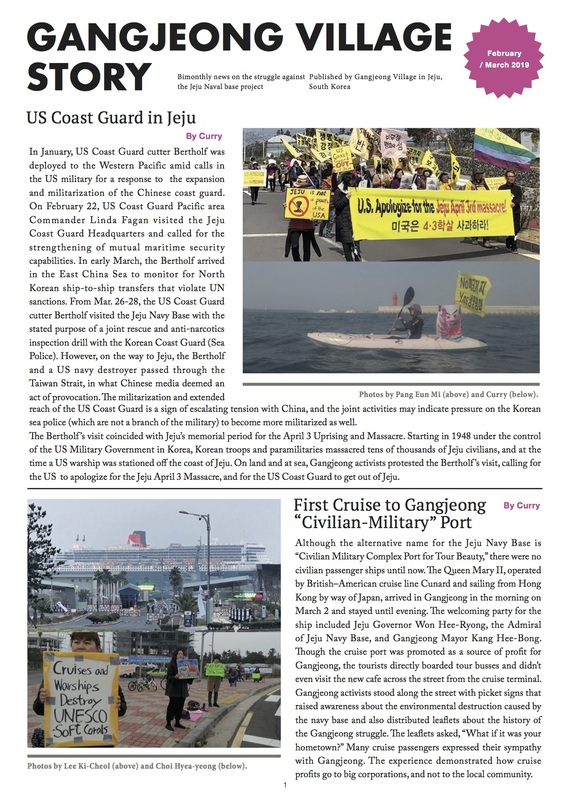 people’s daily human chain in front of the Jeju naval base construction(destruction) gate. Let’s see all in Gangjeong on Aug. 4. All of you can join us in spirit! Photo by Kim Dong-Won/ Gangjeong is endangered. 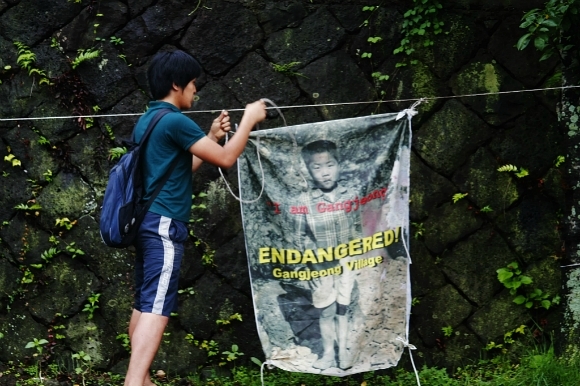 A peace keeper hung a photo of a villager in his childhood. We dream every life visible and invisible to join our grand human chain event on Aug. 4! For more photos, see here. 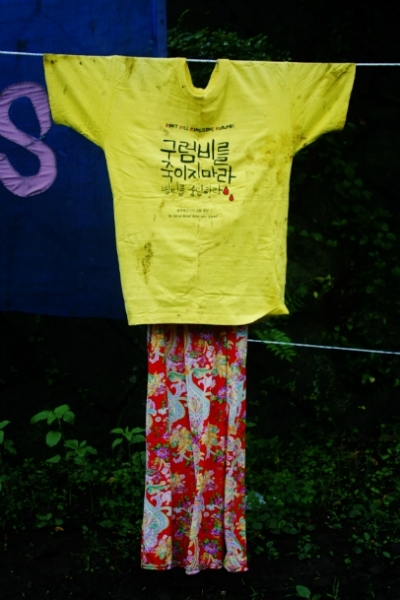 Photo by Kim Dong-Won/ Every t-shirt or whatever souvenirs you mail to us can represent you. The t shirt is owned by a peace keeper who struggles daily. In that way, we want to represent all the prisoners, deported internationals whom we want to be together in our huge human chain event. For more photos, see here. People’s promotion video: Please join our human chain to stop the Jeju naval base project on Aug. 4! Stop the building of war base! Boycott Samsung, the most criminal company for the Jeju naval base project! Stop the oppression on international peace workers! Free all the conscientious prisoners in Gangjeng!